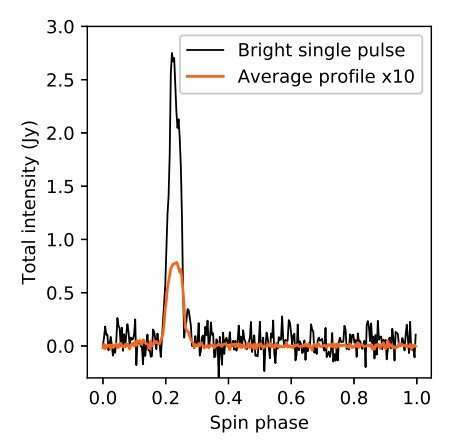 An example of a bright single pulse, integrated between 1,100–1,900 MHz, together with the average profile obtained by summing 5,000 spin periods around the bright pulse. The intensity of the average profile has been multiplied by a factor of 10. Credit: Bilous et al., 2018. Astronomers have conducted a study of unusually bright single pulses (BSPs) from the millisecond pulsar PSR B1744−24A. The new research, which determined properties of these pulses, could contribute to understanding the nature of BSPs. The study is presented in a paper published November 5 on arXiv.org. Located some 19,200 light years away in globular cluster Terzan 5, PSR B1744−24A, or B1744−24A for short (also known as Ter5A), is an eclipsing millisecond pulsar in an ablating binary system. The pulsar has a spin period of 11.56 milliseconds and has a relatively low-mass companion around 10 times less massive than our sun. Observations of PSR B1744−24A have shown that it has highly variable radio eclipses and unusually bright pulses, with intensities up to 40 times the average pulse intensity, and pulse widths similar to that of the average pulse profile. The BSPs from PSR B1744−24A were detected in 2009 by 100-m Robert C. Byrd Green Bank Telescope (GBT). These pulses were observed in the vicinity of the eclipses - in time near eclipse ingress and egress. Unusually bright single pulses are an unexplained phenomenon. Researchers debate whether BSPs are a new, distinct population of pulses, or the result of a propagation effect. The properties of such pulses, like these detected in PSR B1744−24A, make them difficult to classify as a separate emission mode or a giant pulse. In order to learn more about unusually bright single pulses, a trio of researchers led by Anna Bilous of the University of Amsterdam in the Netherlands, has re-investigated observational data of PSR B1744−24A collected by GBT. They have analyzed eight multi-orbit observations of this pulsar to better determine the properties of its pulses. "We present a study of unusually bright single pulses (BSPs) from a millisecond pulsar in an ablating binary system, B1744−24A, based on several multi-orbit observations with the Green Bank Telescope," the astronomers wrote in the paper. In general, the scientists found that the properties of BSPs in PSR B1744−24A are difficult to explain by scintillation in the interstellar medium, by a separate emission mode, or by conventional giant pulses. These unusual properties are: clustering close to eclipses, unchanging average pulsed intensity or profile shape during BSP outbursts, widths similar to the width of the average profile, intensities up to 40 times the average pulse intensity, and correlated structures in dynamic spectra spanning several pulses. According to the study, BSPs from PSR B1744−24A are similar to strong pulses observed from the so-called Black Widow binary pulsar (or PSR B1957+20). Given that the pulses from the Black Widow pulsar were found to be strong lensing by the intrabinary material, the authors of the paper suggest the same explanation in the case of PSR B1744−24A. "We argue that the strong lensing likely occurs in B1744−24A as well," the researchers noted. Assuming that strong lensing can explain, at least qualitatively the unusual properties of BSPs from PSR B1744−24A, the researchers calculated that the proposed lens could be even as small as five to 280 kilometers, and residing as close as 0.06 to 160 orbital separations from the pulsar. The astronomers added that further observations of BSPs from pulsars could be helpful in examining the physical conditions in the intra-binary plasma and providing insights into the emission region within the pulsar magnetosphere. 8. Reflection from behind pulsar's opposite pole lenses back, focused. The graph comparres a BSP (Bright Single Pulse) to an average of 5000 normal pulses. What is the rate that the BSPs happen for this Pulsar? Also, do they come at regular intervals or are they randomly spaced in time?